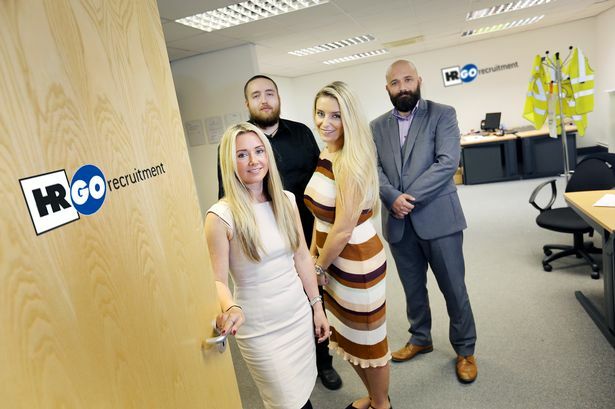 Fast-growing HR GO Recruitment is aiming for further expansion after moving into the North East Business and Innovation Centre (BIC). The long-established firm with offices across the UK has moved to Sunderlamnd from older offices in Newcastle, and the directors believe the centre’s location and well-appointed offices will support rapid growth. Cindy Hare, HR GO commercial director, said it needed larger offices because it was stepping up its permanent recruitment business. Permanent recruitment, running alongside HR GO expertise and achievements in temporary employment, is poised to grow massively, she said. The Sunderland operation had already taken on new staff and would be adding more over the next few months. “We viewed several office locations but chose BIC because it was in the right place and everybody has been so friendly and helpful. The move went really smoothly,” she said. She added that most of her four-strong team, managed by Helen Walton, lived in Sunderland and the BIC’s convenient location made travelling a lot easier. Free parking was also a big advantage. She is confident that the North East, already a vibrant region, offers huge potential for further economic growth. HR GO was founded in Kent in 1957 and celebrates its 60th anniversary next year. From humble beginnings, the business has grown into a £90m operation, with several specialist businesses under the HR GO plc umbrella. Its North East operation is one of more than 30 outlets nationally, employing around 300 staff. HR GO Recruitment serves clients and candidates, finding people with the right skills for permanent and temporary positions. Company chairman Jack Parkinson has pioneered joint ventures, as a successful way of growing the business while leaving entrepreneurial managers with a stake in the operation. “As always it is a privilege to welcome another well established, successful company to our multi-purpose business centre. It’s fantastic to see HR Go and other businesses appreciate the opportunities available in Sunderland and the North East. If you are looking to expand your business take a look at the Office Space and Marketing Support available at the BIC.